Zurich Airport is Switzerland's largest airport and is located 13 kilometres north of Zurich city centre. In 2016, Zurich Airport handled 27.6 million passengers as well as 269,000 flights and around 433,500 tonnes of freight. 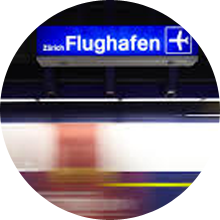 With more than 380 rail and bus links a day, Zurich Airport is the best-connected transport hub in Switzerland. Geneva International Airport is the second-largest airport in Switzerland. In 2016, Geneva Airport handled over 16.5 million passengers, 189,800 flight movements and approx. 75,000 tonnes of freight. 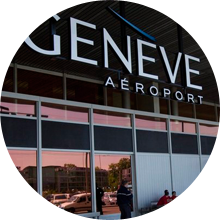 Geneva's take-off and landing runway 5/23 is 3,900 metres long and has a capacity of almost 40 flights per hour. 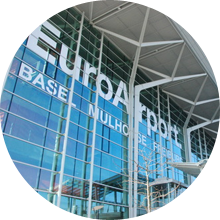 EuroAirport Basel Mulhouse Freiburg is a binational airport in the three-country region of Germany, France and Switzerland. It had a passenger volume of 7.3 million in 2016. Depending on the season, its route network for scheduled flights includes some 70-100 airports in around 30 different countries. In 2016, EuroAirport reported approximately 95,500 flights. 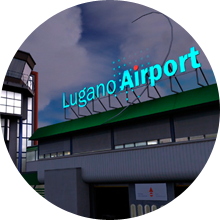 Lugano Airport is an international Swiss airport in Ticino. In 2016, 177,000 passengers passed through the airport. Its take-off and landing runway is 1,350 metres long.